Do you guys have a referral program? Yes, we do! You can check it out here. There are statuses in the transaction screen. What do they mean? When you perform a transaction it goes to blockchain to be processed, and your transaction screen displays a spinning wheel sign. Until the transaction is done the UI won’t allow you to do it again. It usually takes a couple of minutes for a transaction to go through successfully, then you may see its status shown as SUCCESS. If the transaction takes longer to get processed, then it’s likely the gas price you set wasn’t enough. You can retry your transaction again using MetaMask by raising gas price. If your transaction is being processed for more than 60 minutes, the UI designates its status as TIMEOUT. And if it is successful after these 60 minutes have passed, the UI will know that and will change its status to SUCCESS. The TIMEOUT status only means that the UI will be unlocked and the same transaction can be repeated once again. There are rare occasions when blockchain has processed a transaction and, despite that, you may see the FAIL status. That means an unknown error happened. In that case, don’t hesitate to contact the developers to resolve this issue. My transaction won’t go through. Why? Perhaps, you are not using our in-game UI. We recommend that only our game interface should be used (with transactions performed via MetaMask) and that settings shouldn’t be tinkered with unless you have enough experience interacting with blockchain. You should only interact with blockchain and make adjustments to the settings if you are certain about what you are doing. Why didn’t my ‘buy planet’ transaction work? Wait for a while and re-enter the game (re-open your browser). If you still don’t see the planet, it’s likely that another player bought it first. 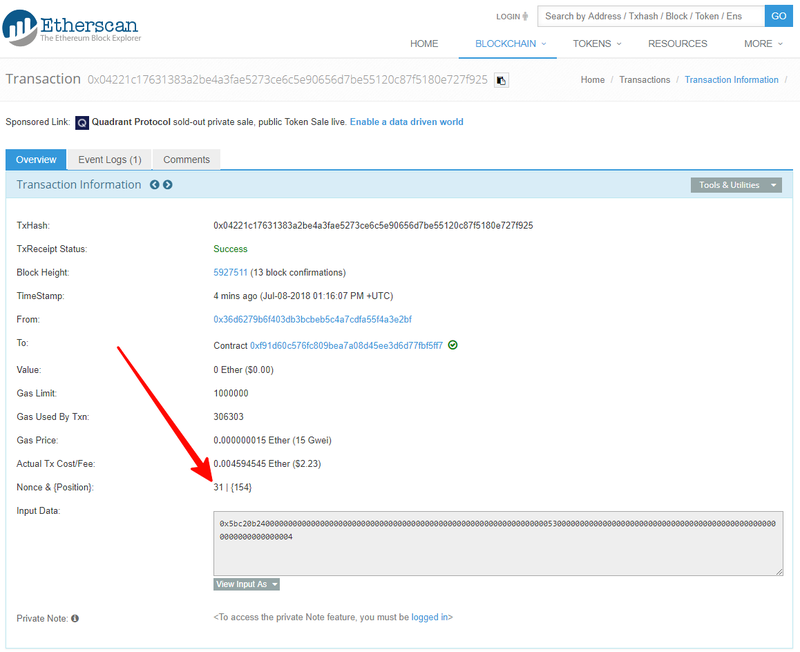 My transactions aren’t shown on etherscan, and my MetaMask is lagging! What’s wrong? This may relate to a known MetaMask bug. The solution: you have to have your seed phrase (a 12-word code phrase which is the only way to restore access to the wallet) backed up, then uninstall and re-install MetaMask. After that click “Forgot my Password (import)” and enter your seed phrase. You should be able to submit transactions again. I have several transactions that were sent through MetaMask but not processed by the blockchain. What should I do? Find the latest processed transaction on your wallet. Open it and remember the Nonce – the number of transactions sent from your wallet (in our example it’s 31). Open your MetaMask and view the list of transactions that are there. If you do not have any transactions with a number higher than the latest processed (in our example higher than 31), it means everything is OK. If you have pending transactions with a number higher than the latest processed (in our example 32, 33, 34, etc. ), you must first make sure that these transactions become processed sequentially. Find the next pending transaction after the successful one (in our example 32) and send it again by clicking on the link under it “Retry with a higher gas price here”. 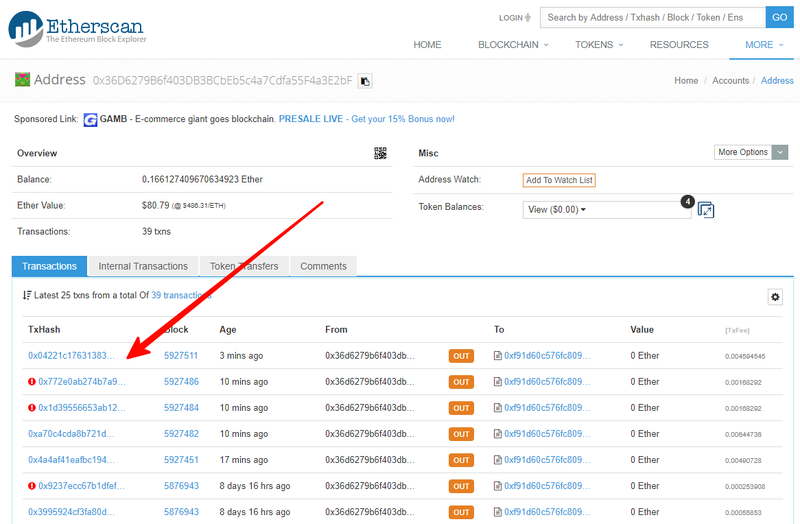 After clicking you will have a new transaction on the list with the same number (in our example 32). You must set the currently recommended gas price (find it on ethgasstation) and send the transaction again for processing. Wait until it is processed. Then repeat these steps with each subsequent pending transaction until you have no pending transactions. Now you can safely submit new transactions. I think 0xUniverse isn’t updated to the latest version. How can I fix it? Open the Google Chrome browser and press f12 (Developer Tools) and right-click on the refresh button. A menu will drop down with three options available. Click on “Empty Cache and Hard Reload”. Re-enter the game (MetaMask might ask you to log in again – you should use your login and password). I can’t paste any address in the auction’s search field to see other players’ planets, nor can I gift mine via GIFT, is there a workaround? 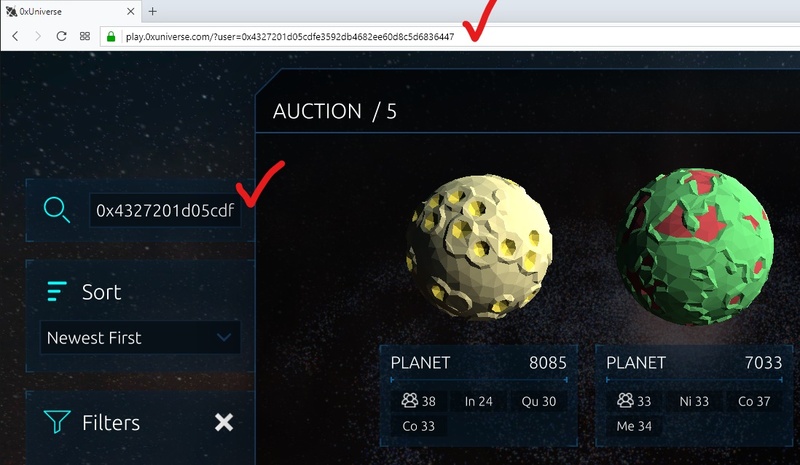 Pasting a special kind of link – https://play.0xuniverse.com?user=0x… – with a wallet address at the end into the browser’s address bar takes you to the page of that account in 0xUniverse. The wallet address after “user=” can belong to any existing player that you want to find in the game. 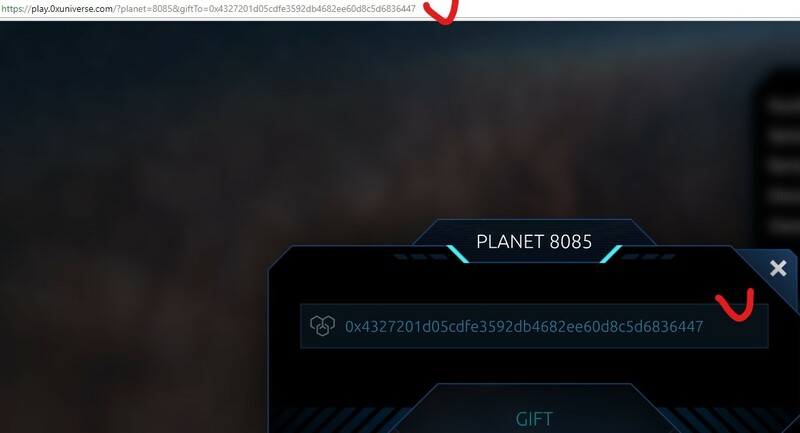 You can see a URL with special parameters has been pasted into the browser’s address input box (with planet number and player’s wallet address). That takes you to the GIFT screen where you see the address already pasted into the GIFT field. The only thing that remains is to confirm the gifting transaction. I see you have 2 million set as the gas limit, isn’t that expensive? The gas limit, in general, is the possible max amount that can be used. You pay for the actual amount of gas used, which is normally much less. I launched a ship and the game returned me a lot of planets from the auction, is that OK? That is normal and it happened due to the logic that is behind most of the in-game transactions. When you launch a ship, the algorithm checks your account for any planets that were put up for sale at the auction previously and had their auction time expire. If the algorithm finds such planets with expired auction times, it will return the planets back to the owner.